I don't usually post twice in a day (or in a week...) but I wanted to talk about something else. Ok, that sounds pretty flat. I mean, isn't everyone on Facebook by now? Well, I wasn't and I didn't want to be. I admit that parts of me still don't want to be. It feels so chaotic and loud to me. I am also very private and the idea that everyone (or nearly everyone) will see what I write, when I update or who I am connected to is very uncomfortable. I know that privacy settings can be tweeked, but it is still unsettling to me in its concept. I am also continuously asking myself if my college friends should see this update or if my business colleagues have any care for that other information, as I tend to keep different aspects of my life very separate. On the other hand, I do admit that, once I start filtering out everything that shows up on Facebook page, I like seeing what other people find interesting or are doing. It has been an interesting experience, figuring it all out, finding people and looking through my friends' pages. It is certainly out of my comfort zone and I am taking things slowly. I am focusing on people who share some of my interests, bloggers I read and mainly online acquaintances or friends. I am still very hesitant to add "real life" people and family. Perhaps, in time, I will add them as well. And, to top it off, I created not only my profile but also 2 additional pages, one for each of my Etsy shops. The StonesFromBrazil page is still bare, but I am starting to be active as ContemporaryJewelry as well. Would you please give me some FB love? I need a little push to keep active on FB! As I said in my last post, I am working on a long term project on what marks our lives. The first piece was done a while ago, long before I came up with this series, but it fits perfectly and so I decided it would be a part of it. I am, after all, the "artist" here so I can just say so. 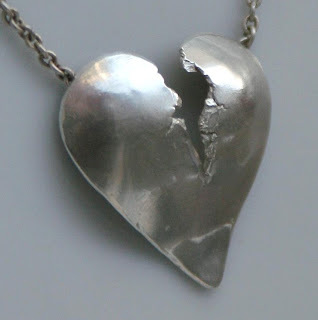 Heartbreak isn't only caused by love - it can be lost dreams, disappointments, sorrows, losses. All that matters is that something that is important to us is lost, either in reality or in our dreams. Everyone will have moments like these in live, where everything seems bleak and hopeless, where our efforts seem puny and when we feel we have just "lost" at life. 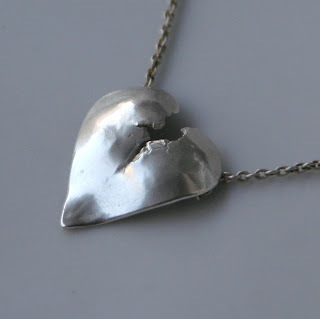 This heart was pounded out, quite literally. I worked it with a hammer until it reached its breaking point, creating the beautiful texture in the crack. It was a good way to work my way through what I was feeling at the time. Life, of course, isn't all bleak, so the next piece is much more cheerful! It is already on my workbench, but I know I will tinker with it a lot before it is done. A while ago, I was told I should start to use environment friendly or green practices in my jewelry making. The topic is quite hot and it would be good for marketing my shop. Besides, the number of people searching for "green" or "eco-friendly" tags is growing, so it would get me more exposure. My first reaction was "What makes you think I don't take environmentally conscious decisions?". The second was, "Should we only act responsibly because it brings in good marketing?". As a matter of fact, I do think all my process through and make it as environmentally responsible as I can. Strictly speaking, I must say that producing a luxury product will never be 100% environmentally friendly (I am sure that the metal would be better in the earth and the energy to refine it and, eventually, recycle it, unspent). But I make sure I recycle every last scrap of metal, I group projects in order to minimize energy waste, I avoid harsh chemicals and use proper disposal procedures. Now, why don't I mention this in my listings, shop description, etc? Because I see this as a necessary part of doing business, like paying taxes, using responsible sources and not cheating anyone. Those would hardly be interesting tags, would they? "100% of taxes paid on this item!". I don't respect the environment to make a buck, but because it is part of being a responsible and sustainable business. Don't squeeze limes when your hands have a network of small cuts of them. It won't be pleasant at all. On the other hand, I am now eating a bowl of warm, fragrant lime and mint risotto for dessert. It almost makes me forget the earlier pain. 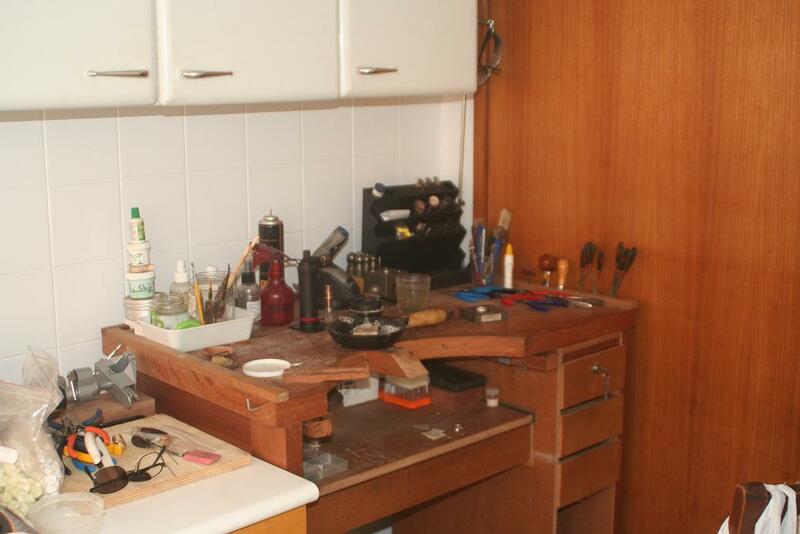 I admit I have serious bench and studio envy. 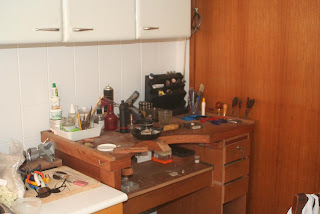 I often come across pictures of other metalsmiths' workspace and they all seem so spacious, nice and full of fun tools. My workspace is... none of those. I live in a small, one bedroom apartment. One bedroom, one living/dining room, one kitchen, one bathroom. Since the living/dining room is carpeted, guess where is left? Yup, my bench takes up a corner of my kitchen. This has some advantages: tiled floors, running water, good lightning. And one clear disadvantage: I don't want my food to be spiced up with silver fillings and a touch of jeweler's pickle, or to be flux fumed. So having a clear separation of areas is a must. If I am working, all food is put away. There is good natural airflow, but both sets of windows must be open at all times (this also draws fumes away from food areas). And nothing moves from one side of the kitchen to the other. The surprise bonus, however, is that the gas range is a great additional heat supply for some soldering situations: nice, even heat from all sides! Add a few charcoal blocks and you have a natural little furnace. All fluxing must be done beforehand, of course. I admit I splurged on my bench. It is a custom made, hardwood monster (it nearly didn't fit through my door!) that I designed to have all the things I find necessary: secondary benchpin to the side for sawing, drawers, apron, an under the top shelf, slots for files to one side and, best of all, the perfect height for me. My poor neglected blog... It has been over a week since I updated. But I have good news! I have a new shop in Etsy: Stones From Brazil. This shop focuses on fair trade, hand cut, minimally treated gems from my homeland. I started this shop for various reasons. First of all, I was dismayed by the difference between what local cutters and miners got for their gems and what the typical customer outside Brazil was paying. It wasn't good for neither cutter nor customer. I think that I can help both by paying a better price here and offering a better cost to you, my client. I am trying to keep overhead as low as possible to maximize benefits for both ends. Of course, Brazilian postal costs do not help (which is why I am shipping smaller gems in ordinary envelopes, without tracking). The second reason was fair practices. I aim to offer untreated gems or gems with minimal treatment (heat or light oiling), but, most important of all, to divulge the treatments. And, if I don't know it, to state it. I want you to get what you think you are getting, not a well told story. Finally, I just plain love gemstones. I love picking out a beauty from a large parcel of so-so stones. I love finding an unusual color, interesting inclusion or unique cut. What a perfect excuse to spend a lot more hours doing so! If you need something specific or unique, let me know and I will keep an eye out for it. To top it off, I am having an opening sale with the coupon "GrandOpening"! Enjoy!